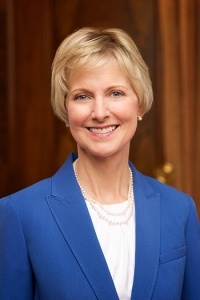 Jean Barrus Bingham was sustained as first counselor in the Primary general presidency of The Church of Jesus Christ of Latter-day Saints on April 2, 2016. She was serving on the Primary general board at the time of her calling. She was released on April 1, 2017, and sustained as the seventeenth Relief Society general president. She was born on June 10, 1952, in Provo, Utah, and is one of nine children born to Robert Rowland and Edith Joy Barrus. She lived in four states growing up, graduated from high school in New Jersey, and earned a master’s degree in education from Brigham Young University where she met Bruce B. Bingham. They married in 1972 and are the parents of two daughters. She has served in the Relief Society, the Young Women, as well as the Primary, and has been an early-morning Seminary teacher and temple worker. This page was last edited on 1 April 2017, at 18:48.